Global Minnesota is proud to host the following two recipients of this year’s U.S. Secretary of State’s International Women of Courage Award. Yezidi activist and gynecologist, Dr. Nagham Nawzat Hasan from Iraq, has dedicated her career to promoting equality for women, combating gender-based violence, and providing psychological support to survivors. Since the 2014 takeover of the city of Sinjar by Da’esh, resulting in the massacre of thousands of Yezidi men and the enslavement of Yezidi women, Dr. Hasan has focused her efforts on rescuing and assisting Yezidi girls traumatized by Da’esh. Responding to the humanitarian crisis, Dr. Hasan was one of the first physicians to provide psychological counseling and health screenings to freed and escaped girls. Today, she regularly visits Internally Displaced Persons camps with large Yezidi populations to conduct outreach and encourage parents to allow their daughters to visit her clinic for basic health care and psychosocial support. Minister of Legal Affairs, Dr. Nihal Naj Ali Al-Awlaqi from Yemen, has served as Yemen’s Minister of Legal Affairs since her appointment in January 2016. She also is a member of the Republic of Yemen Government’s delegation to the peace talks and is a lawyer by training. Previously, she was a member of the Constitutional Drafting Committee where she worked to ensure that women’s rights and interests were integrated into a new draft constitution, and advocated for greater access to education for Yemen’s young people. Dr. Al-Awlaqi also served as one of the key women’s representatives in the National Dialogue Conference and has worked as a legal advisor to the Women’s Center for Training at the University of Aden. During one of the most challenging times in Yemen’s history, Dr. Al-Awlaqi serves as a unifying voice for peace, human rights and women’s rights and a more democratic future for her country. Join us for the opportunity to meet these extraordinary women and learn about the change they are implementing across the globe. Established in 2007, the annual U.S. Secretary of State’s International Women of Courage Award honors women around the globe who have exemplified exceptional courage and leadership in advocating for human rights, women’s equality, and social progress, often at great personal risk. 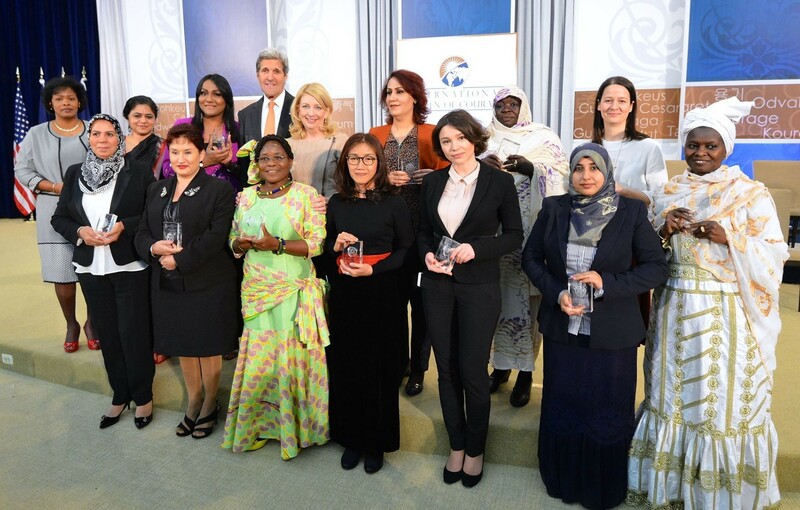 This is the only Department of State award that pays tribute to emerging women leaders worldwide. This event is made possible by a generous gift in honor of Katherine W. Merriam.